Our vision for Rebuilding Together Express has come true: small teams of 4-5 volunteers, working 4-5 hours, and spending $400-$500 for materials are helping seniors age in place safely in their homes. We’ve refined our procedures, enlisted the help of more than 40 volunteers who want to work regularly throughout the year, and completed repairs to more than 75 homes. RT Express encompasses about 30 common repairs, with a strong emphasis on fall safety, fire safety, minor plumbing and electrical repairs, and energy upgrades. 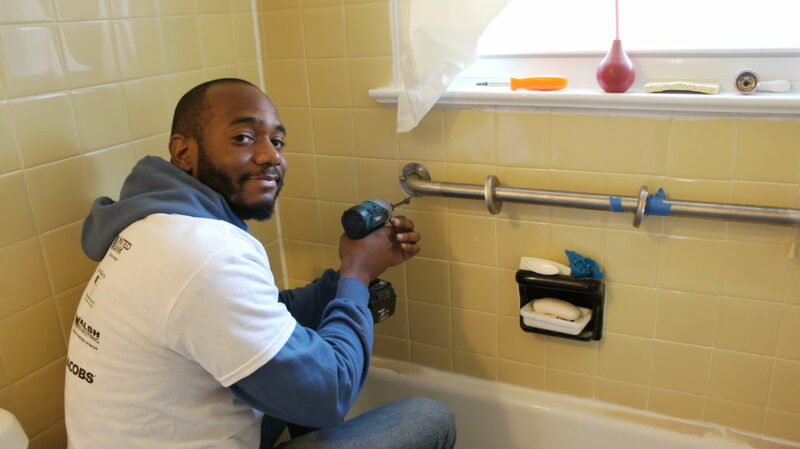 Our volunteers love to solve problems, and our low-income senior homeowners love the repairs and accessibility modifications that allow them to continue to live in their homes safely and comfortably. RT-AFF tracks results based on before and after comparison of Rebuilding Together’s 25 Health and Safety Priorities. For our first 75 RT Express projects, our teams corrected 90% of all hazards and 93% of fall hazards – at a cost of less than $500 per home for materials. The direct impact and extraordinary cost effectiveness of RT Express helped RT-AFF win the Commonwealth Council on Aging’s top Best Practices Award for 2018. We are working now to leverage that award to persuade hospitals and health care providers to expand fall prevention strategies to address fall hazards in low-income seniors’ homes. Read Please Step Inside to learn more about the impact of our first 75 RT Express projects, including information on the science behind fall prevention, the critical gap in the current continuum of medical care and how RT Express contributes to reducing fall hazards.